The inscription in the ground says that it’s 570 meters to the pagoda. The brick tiles of the path are smooth; the soles of my shoes slip on them, the tips catch in their gaps. I tread carefully but decide I’m in a hurry. It’s late afternoon, nearly dusk, and though the mountain air is brisk, my t-shirt clings to my chest. The progress markers every so often–400 meters, 300 meters, 200 meters–don’t make the climb feel any shorter, but it’s no large surprise when suddenly the tree-lined path opens to a courtyard, a sea of white stones. 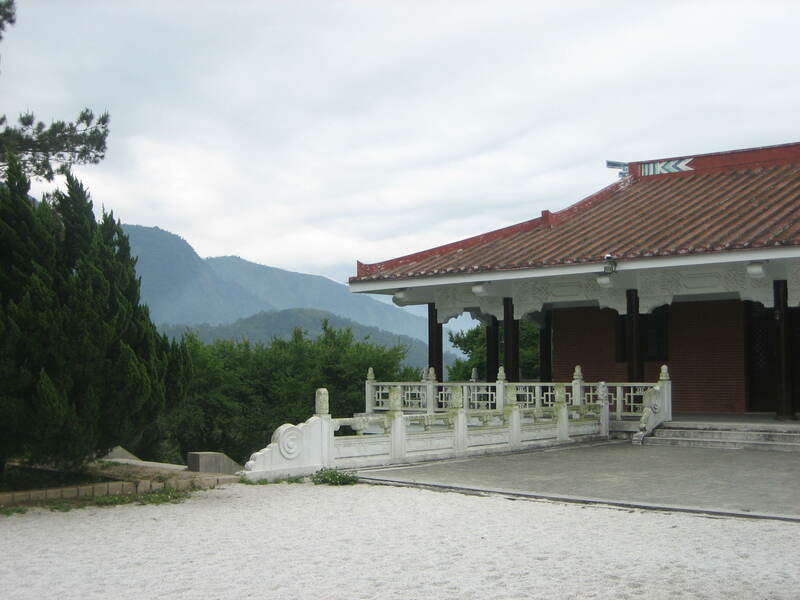 There the Pagoda looms, mountain peaks in the background, Sun Moon Lake far below, unseen. 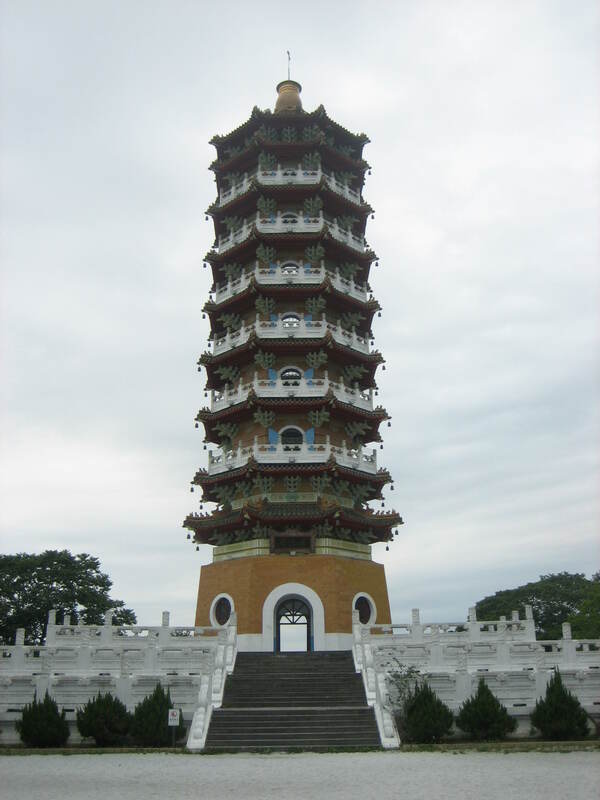 At a height of 46 meters, the Ci-en Pagoda’s top stretches 1,000 meters above sea level, a testament to Taiwanese OCD. While it has the air of being timeless, it was built in 1971, less than 50 years ago. 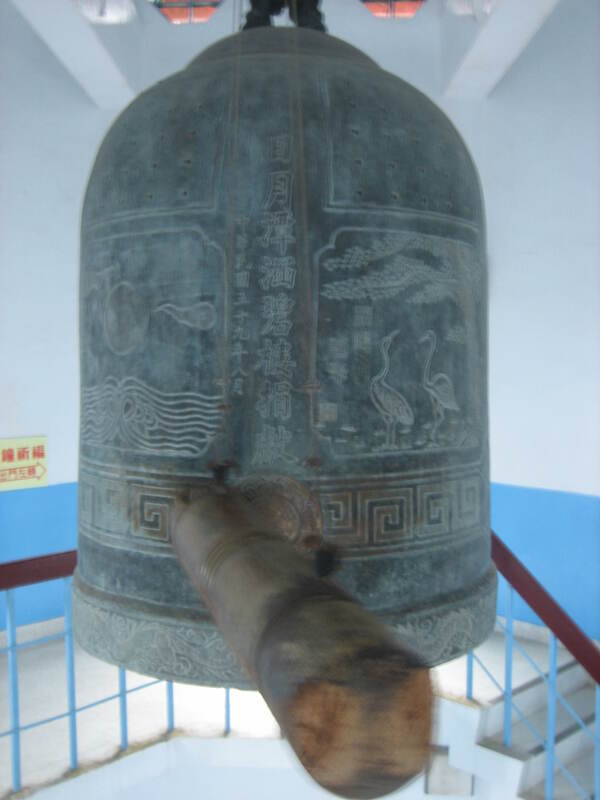 I hear the tolling of a bell from up above, and make my way through the pagoda’s entry. The few tourists here are on their way back down, so I’m alone inside when I start up its nine stories. The low railings throw off my sense of balance, and the sensation of literally walking in circles disorients me. There’s something claustrophobic about being aware that I’m climbing higher and higher but not seeing any changes in my surroundings. I wonder how monks find peace performing their duties in such buildings. 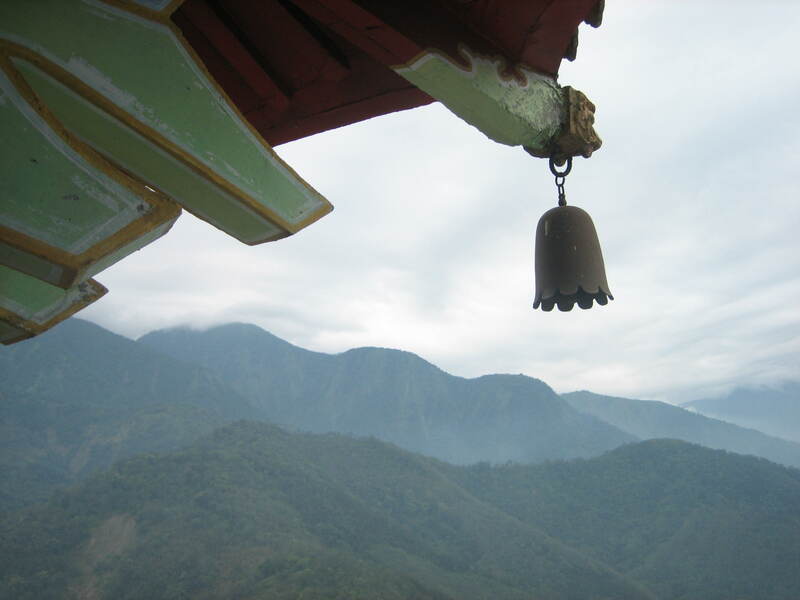 At the top of the stairs, the giant bell I heard earlier beckons; next to it, a wooden log dangles from a rope. First I step outside; Sun Moon Lake is far below, its coastline reduced to geometric curves, its aquamarine motionless. The white of the courtyard below looks like snow. I hear my heart in my ears. I’m drawn to high places, whether they be mountain peaks or tops of pagodas, but they don’t provide me with a sense of ease. The leaves at the top of a tree can feel rootless. Here, as in other heights, there’s a mild restlessness with dashes of adrenaline and vertigo, but not serenity; if I’m searching for that, I haven’t found it here. I can’t trick myself into believing I’ll be staying for long. There are times when you’re ready to go as soon as you arrive. Some moments of solitude are for basking in; others, not quite so. It won’t be until my hike back down the mountain path, putting one foot in front of the other, that I’ll find an inner stillness. But first I face the bell, reach out and take the log in both hands, brace myself for the sound, and let go.